Who knew Justin Lin was such a Star Trek fan? And he is. He met with J.J. and Lindsey Weber at Bad Robot and they fell in love with him, and brought him in to meet with us and to meet with everybody at Paramount and pitched a version of the film that we just thought ‘wow, that has huge potential.’ We’re not allowed to talk about the specifics of the film to say the least, but what we can tell you is there are some sequences that we have seen in pre-vis that are just incredible. It’s something that we would love to be involved in. As I’m sure everybody knows, the rights situation given the CBS and Paramount divorce on the Star Trek rights is very, very complicated. The exact status of it is absolutely something being worked on. We would love to be involved, but all to be determined at this time. 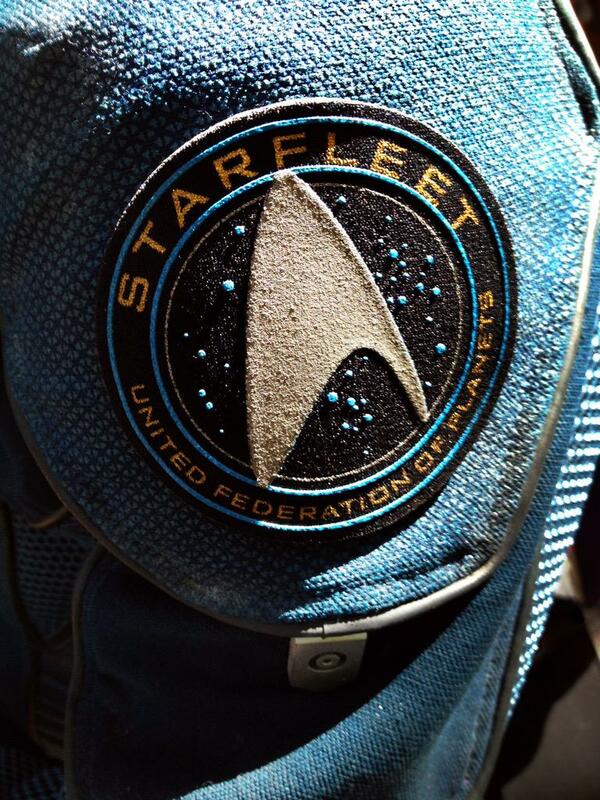 Isn't that patch from the outfits Kirk and company wore in the last movie in the scene where Carole Marcus is introduced? Ah, upon closer inspection, you're correct. While new uniforms are always cool to see, I kinda hope that this is just another alternate outfit like we've seen in past films and doesn't meant that they're ditching the TOS-inspired uniforms; I'm still a bit curious what Chris Pine would look like in some variation on Kirk's green tunic. It's only a shoulder, but it looks to me like some sort of outdoorsy/utility uniform, or a very flexible space suit; so am sure the normal uniforms will still feature on the Enterprise.